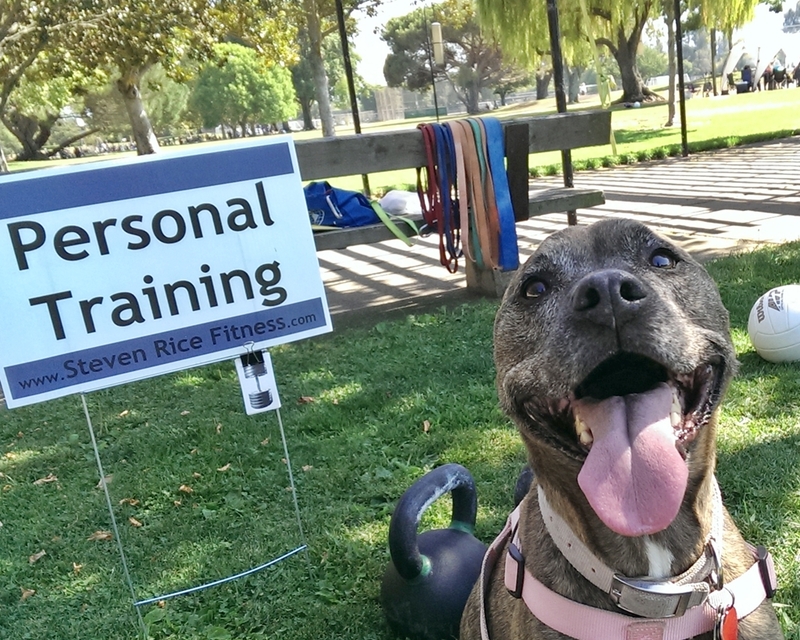 Most clients at Steven Rice Fitness, and myself personally, train outside. We are either in parks or outside the client’s home. In this first column for The Trainers I’ll try to convince you why this should also be part of your fitness strategy. For some people going to the park a few times a week for a workout is the full extent of their fitness routine and that’s great. Many though also participate in endurance sports such as cycling or running, or go to the gym some days and outdoors others. In both cases variety is a major benefit. 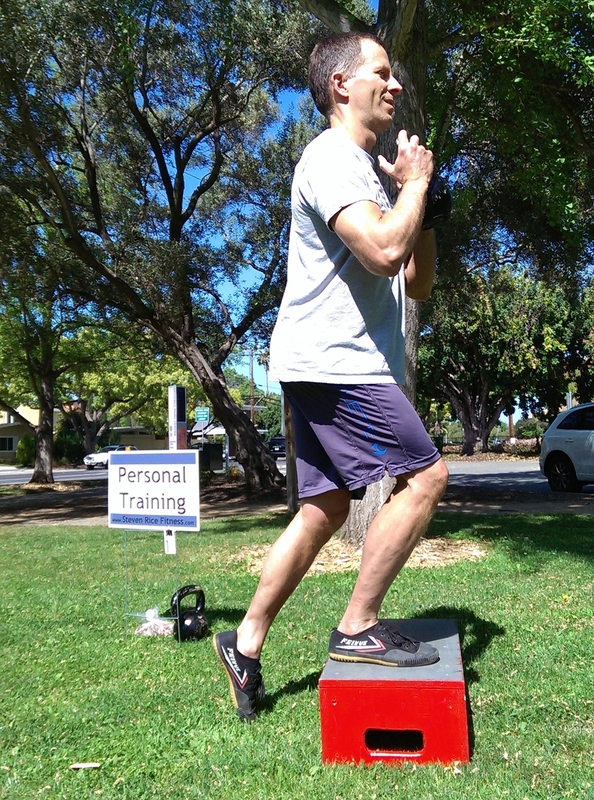 The endurance athlete works on cross-training by moving in new ways and building strength with resistance training. The regular gym goer breaks the routine and familiarity their usual workout by being in a new environment with new exercises. In both cases the outdoor workout supplements the primary training. For example, in the gym someone might focus on “the big lifts”, meaning back squats and deadlifts with a barbell, bench presses, and bent over rows. 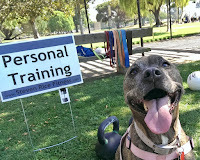 Two or three days a week she’s lifting heavy iron, then a couple times going to the park for mobility drills, kettlebell complexes, and suspension training. A dedicated runner could do a shorter run in the morning some days, and then in the afternoon work on strength training in multiple planes of motion and core work with body weight and resistance band exercises. But why train outside either exclusively, or for variety? What’s special about strength training outside? Space, lots of open space. I’ve never been crowded at a park, even Saturday morning when it’s full of people. And you’re not limited to a lane, trail, or corner for exercise and movement. Interesting, but not distracting, things happening. I’ve been with a client when, within sight but not too close, were little kids learning soccer in Spanish, Tai Chi practitioners, medieval war gamers, skate boarders doing tricks, and dogs. At the same time. And if you want, you can take your own dog. Gyms have TVs. Run, jump, drop and throw things, crawl and climb. Grass is just a much more friendly surface for high impact exercises and ground movements than a floor or pavement, and sand pits may also be available. Playgrounds are for grown-ups too. HAVE FUN! In the next column I’ll give some equipment tips on how to get started, particularly for strength building exercises. As kids, all we needed was to run outside and play with whatever we found, and as adults that creative spontaneity is still great. But I want to discuss training, especially strenth training, and not just playful exercise. That takes some equipment, and some planning. Training outside requires a certain amount of lugging stuff around. This means using equipment that is as light, and versatile, as possible. However there’s no substitute for lifting heavy things to develop strength(and more), so the first bit of gear I recommend is kettlebells. 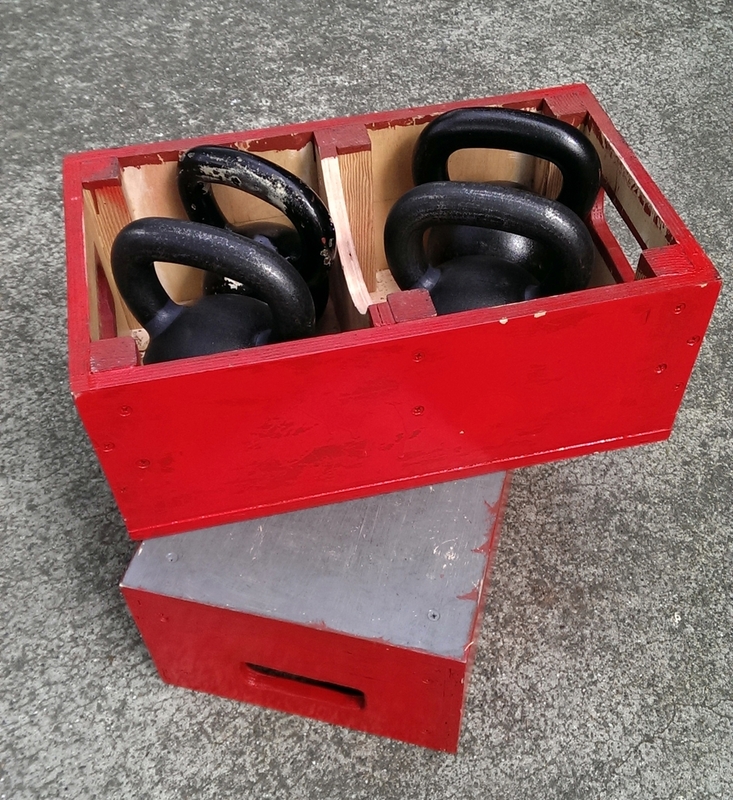 Kettlebells are simple, rugged, and relatively portable. The other gear you’ll want is best for upper body, so look to kettlebells for lower body emphasis and that means heavy ones. If you’re just starting, an average woman might do well with 8, 12, and 16 kilogram bells, and an average man could get 12, 16, and 20 kg sizes. Remember that you’ll be getting stronger, and learning a variety exercises, so owning a wide range will eventually be needed. Buying in pairs is useful but not essential. Don’t worry about carrying all this at once though, for a given workout you can plan out what you’ll need and leave the rest home. Next up is resistance bands. My recommendation is to get the ones that are a continuous loop and add a separate handle. Straight bands with built-in handles are easier sometimes, but more limited in configuration. 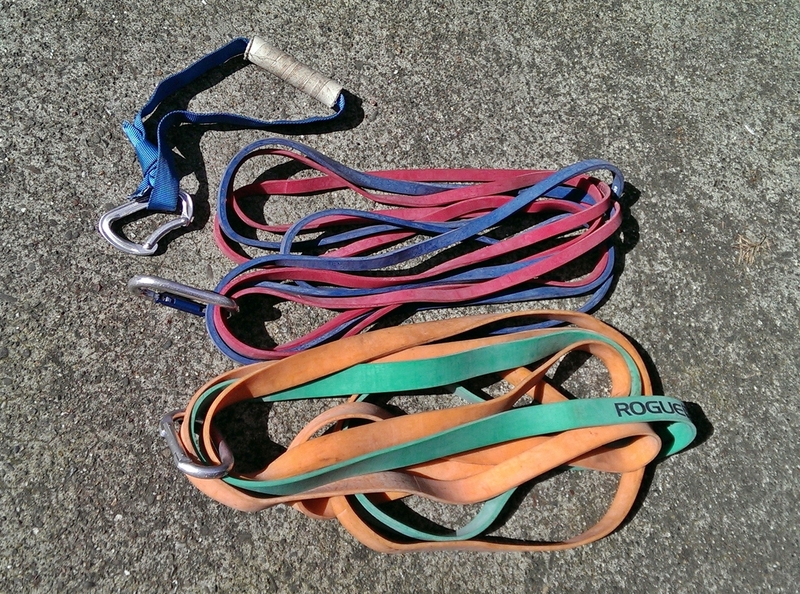 I like to put several bands on a single carabiner then pick the ones needed for resistance, to combine in chains, or loop at the mid-point. Get 2 or 3 pairs around 1/2″ to 1″. 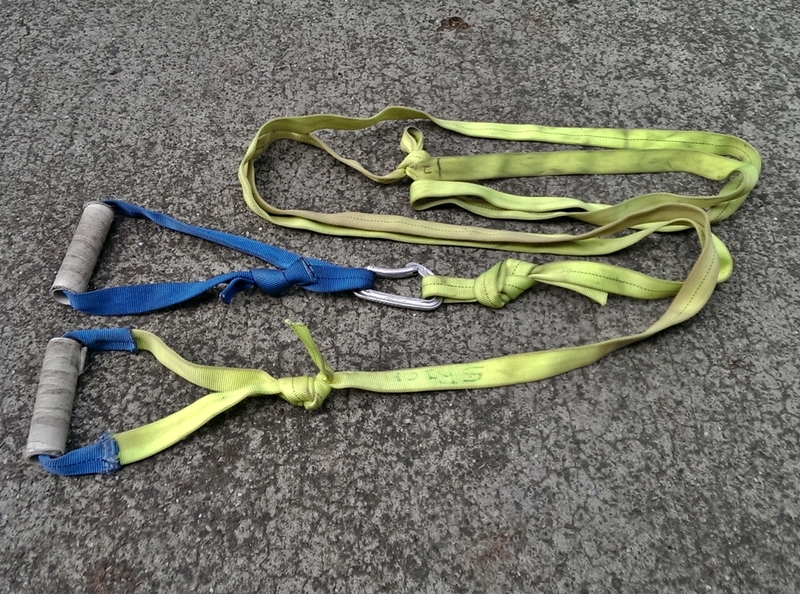 Homemade suspension trainer from climbing webbing. 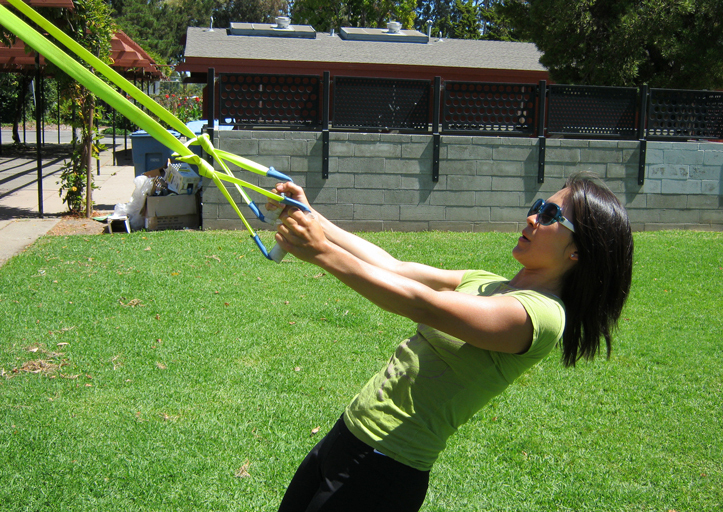 No exercise kit is complete without some form of suspension device, just because they are so portable and inexpensive. TRX is the most common brand, but I suggest the Jungle Gym, or make your own. Simpler is better. These gizmos have hundreds of uses, although in my opinion only a few are really good. A few other possibilities are medicine balls, because you can slam them without worrying about what they might bounce into; sandbags, because leaking won’t matter; and slosh pipes, because they are so large they don’t fit indoors well. In picking a spot for exercise, I like one that has moderate length grass. Thick, lush grass is nice for mobility drills, but can be soggy so you and your equipment get messy. Of course you can change location for each particular exercise. A nearby hill or just uneven terrain is great for sprints and loaded carries(eg Farmers Walks). Most resistance band exercises, and all suspension ones, require an attachment point. For bands a tree trunk, sign, or play structure will do. Suspension devices need to be mounted high, so pick a spot to work out with something above your head for attachment. Playground structures, especially swingsets, work great, or use a low but sturdy tree branch. The ideal spot is a nexus of grass, some pavement, and a playground. Sun and shade, to taste. A quick mention of footwear- Try minimal! A lot has been written concerning shoes for running on pavement, but for me the big win is feeling the texture of natural ground under you while doing strength and mobility training. Let those feet and ankles to do their job without being isolated and constrained by thick and restrictive shoes. “But, Dude, what about Nature Stuff?” I’ll write more about using natural and man-made features in another column, but since the main focus at Steven Rice Fitness is strength training, equipment that allows measured and progressive training comes first. Stay tuned! 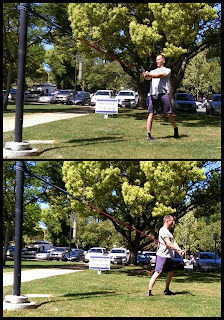 Here is a simple and powerful workout using only a few bits of equipment(see Getting Started with Strength Training Outside). Ten minutes of brief stretches and cardio to loosen up and get things moving. See Mobility and Warming Up for some background. The kettlebell should be heavy enough so that 15-20 reps really works you. Remember to bend at the hips and keep the spine neutral(straight). Getting in-person instruction is important, but here’s a good beginning video. Depending on your level of strength, do the pushups with hands and feet on the ground, with the hands elevated, or with the feet elevated. Park benches are good for this. Keep a straight plank position throughout. For a bonus, use a resistance band crossed on your back and looped around each hand. Try for 8-12 reps. Using a plyo box, curb, bench, or something in between, keep one foot on the step and take the other from the ground to held in front of you, like you’re climbing stairs, except the foot goes back to the ground. Don’t bounce off the moving foot. Use bodyweight, and hold a moderate sized kettlebell in front of your chest. Make it hard enough so 10-15 steps per leg is your max. For the rows, keep the body straight, and move the feet closer or further from the support to adjust the level of difficulty. If you can do a suspended row directly under the support, give yourself a pat on the back(after standing up). 8-12 reps is good. To perform a RFE, or Bulgarian, split squat, stand well in front of a solid, elevated surface holding one kettlebell at the chest, or one or two weights at your sides. Dip your back knee to the ground, trying to not lean forward, then straighten the leg. 5-8 reps per side. The press is done standing straight up. It starts with a kettlebell held in front of the shoulder. As you lift it overhead pull your shoulder back, so the bell ends up above your back and your arm is pointing straight up. When learning the press use a moderate weight for 10-15 reps, then transition to 5-10 heavy reps.
For a standard walk hold equally sized kettlebells in each hand, or do an offset walk with two different sizes. Take a stroll on the grass- I like to walk around the same tree every time so I know I’m moving the same distance. Really work at staying tall and keeping the shoulders back. Try to go 20-50 yards, at least, and don’t forget to switch sides if you’re doing an offset. 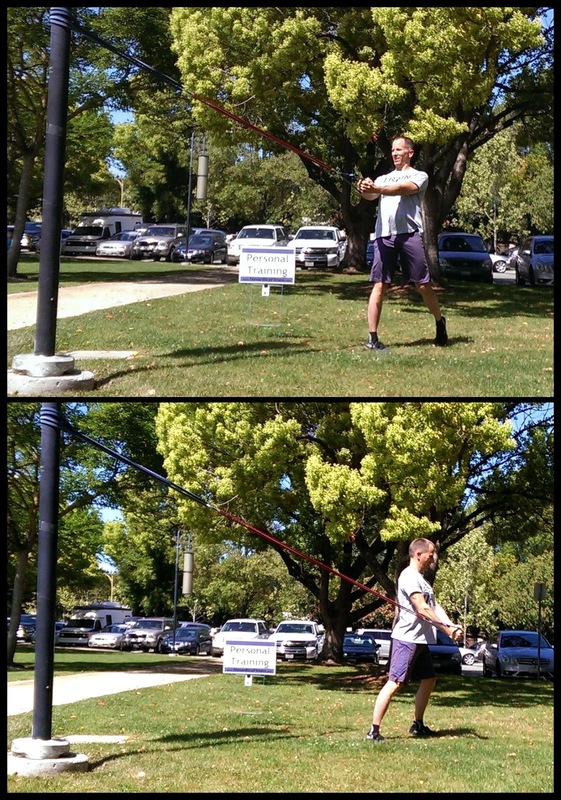 Really work the transverse plane using a resistance band for chops. Resist movement in the core and spine, and create movement in the hips. Turn the arms, chest, and hips toward the attachment point, then rotate them all away pivoting on the hips. 5-8 slow reps each side, without a pause. The workout ends with some slow stretching. Pick areas where you feel tight, and take more time with them than you did at the beginning.